We truly listen to our customers and try to understand their needs and challenges in the field of business processes, the implementation of self-evaluation based on the EFQM standard, and the deployment of ISO 9001 and ISO 14001 standards. Our consulting business perfectly aligns with our DNA software, which is renowned for its effectiveness and user-friendliness. We help our customers to achieve success. Our goal has always been added value for our customers. Our consulting experience spans over 30 years and multiple successfully completed domestic, as well as international projects. 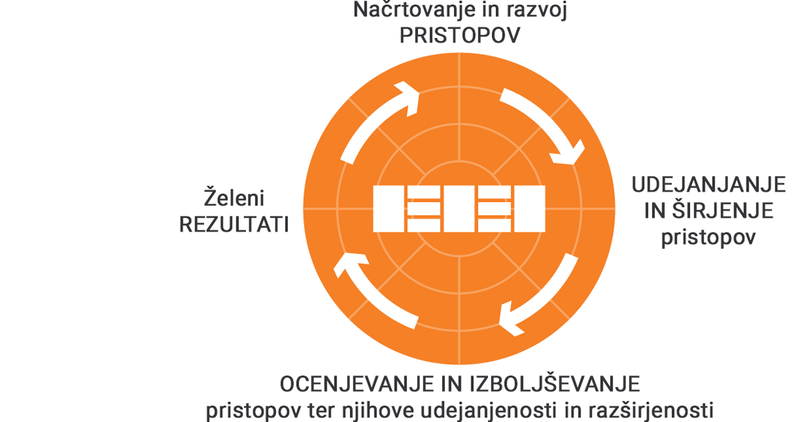 We have extensive experience in implementation of the process approach, in Slovenia, as well as in other countries. Process Approach (six pillars of the process approach) allows exceeding departmental organization, better communication, rationalization, look beyond the business and provides a number of improvements. In the introduction of the process approach, we have many years of experience at home and abroad. For the process approach we offer you in support our application DNA (support for business processes), where you draw your processes and documentation, modify and effectively connect with other documentation, employees and external actors in the process. It allows for traceability of changes. For documentation of processes, we have developed a methodology MDP, which is also consistent with BPMN 2.0 (global standard for the drawing of processes). The advantage of the methodology is that it is easy to understand and user-friendly. 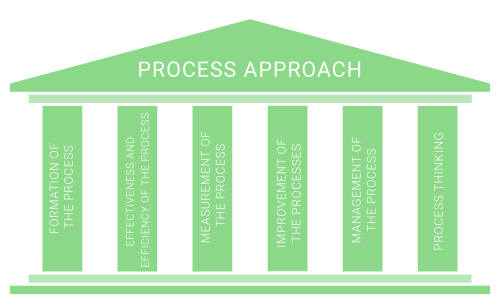 Clear overview of process' architecture and how they are connected. The flow of each process and user-friendly descriptions of each step. By moving to a step, a user gets a clear overview of all the important details, including instructions, risks, indicators, etc. Mag. Sc. 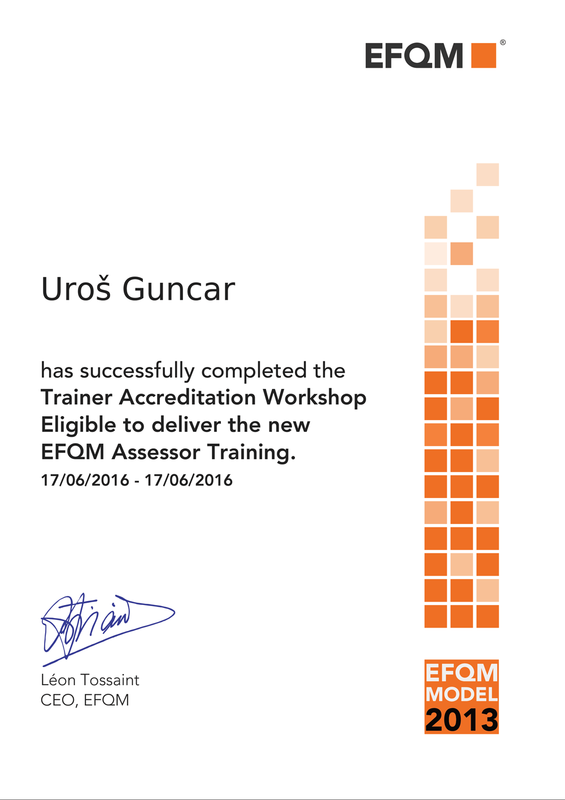 Uroš Gunčar is European assessor for EFQM excellence model and the lead assessor for Recognition for Business Excellence (PRSPO). He has assessed numerous organizations in Europe, Asia, and the Middle East. In his role as the lead assessor for PRSPO, and within multiple pilot projects, he has led assessments of over 30 Slovenian organizations. 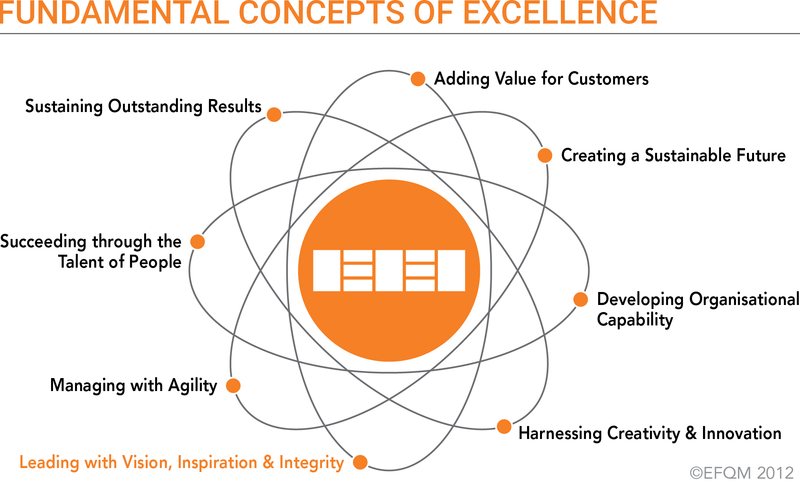 No matter where on the path to business excellence you are, we will help you to ensure your efforts are focused on high added value. Alongside that, we will also provide you assistance tailored specifically to your needs. We have extensive experience in the use of the model in both the private and the public sector. We assist with the introduction of ISO standards into your organization. We assist in establishing a system of business consistent with the selected ISO standards (9001, 14001, etc.). 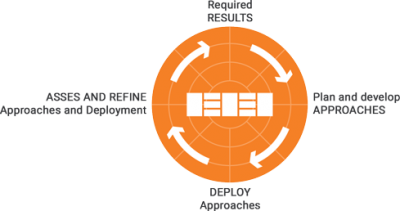 With this, we are aiming primarily at the business with less paperwork and duplication, which is often a problem in ISO systems. Many companies have stopped using the ISO standard because of large amounts of paperwork, due to costly external audits, and due to lack of value added realized by the introduction of standards . We offer a better approach: with the support of our DNA application where you can easily establish the selected system with minimum administration. By using our solution, you will be able to focus on achieving your business goals and not on the work with the system itself, which many even hinder the work. The standards will be used to your advantage, rather than you having to adapt your way of work to them. Special focus is paid to processes, risk management (environmental, financial, legislative, etc.) and KPIs (Key Performance Indicators). 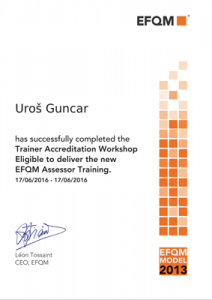 At the same time we upgrade standards with elements of the EFQM model by introducing RADAR's way and assessment type, with a focus on strength and best practices of the organization, not only on error detection. 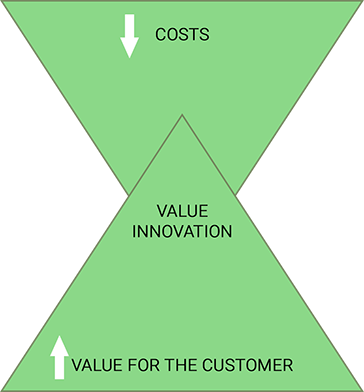 Help in setting up the business model with the value innovation. 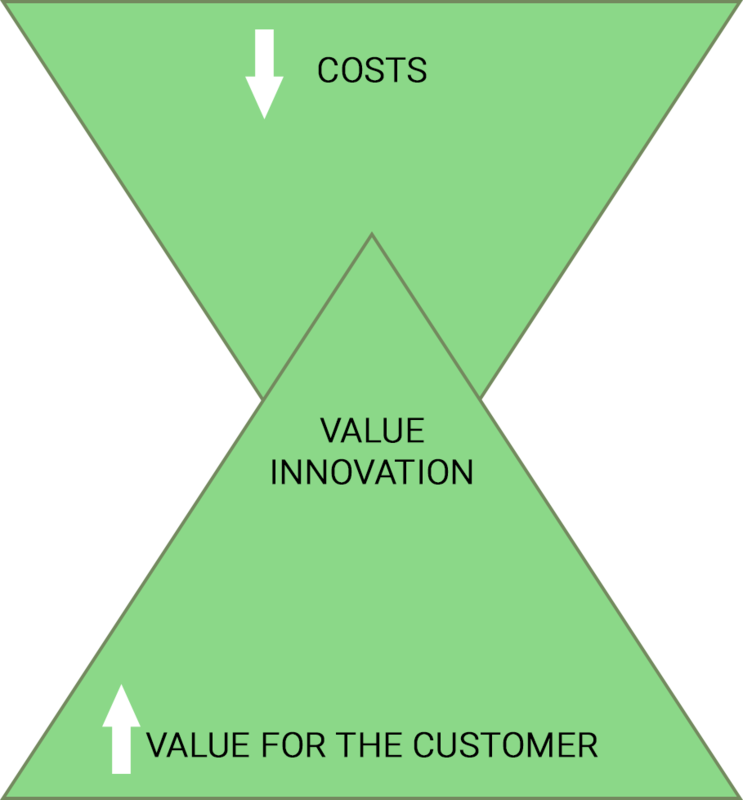 Innovation business model is aligned with usability, price, and costs. 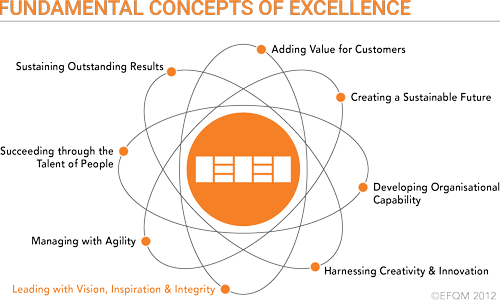 Any company can produce a business model that includes technology, services, products, personnel, processes, etc. so as to differentiate it from competition, which could make long-term business success.